Pure Country with its Roots showing. What a way to start an album – “I wish hadn’t done the things did when I was young/all the little tablets I melted on my tongue.” Now there’s an attention grabber! Alyssa then goes on to list the other things she now regrets on title track, Glory Bound; including the fantastic line “I wish I hadn’t written my rebellion on my lungs.” Not only whip smart lyrics, but the band also create a fast moving, steam train ride of a tune in the background. All I can tell you is that in Alyssa Graham we have discovered a diamond of a Country singer and on the heart breaking Blow Wind Blow, she more than matches any of the blondes you will see on the CMA Awards; as her voice dynamically swoops and sweeps through an epic song of a young woman looking in the mirror and seeing her parents and long lost brother staring back at her. Don’t be surprised if this song turns up on a Reba or Faith Hill album; as it’s perfect for them; but much better here; as is Mama, an unadulterated Country song harking back to the days of Patsy Cline; but still sounding as fresh as a daisy here. The Grahams aren’t just about the singer; as husband Doug and an all-star band can also dosey-do with the best of them as they prove on Kansas City with has its own guitar v fiddle duel; but again Alyssa more than matches the boys in the band. I instantly fell in love with 70’s sounding innuendo laden Biscuits the first time I heard it; as it could have been a Dolly or even Skeeter Davis song in another life. 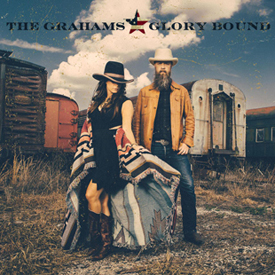 While there is a timeless feel to the whole album; Borderland and Promised Land are both bang up to date Country songs; with a very sharp edge to them. Glory Bound by husband and wife Doug and Alyssa Graham has been a chore to review; simply because I’m not sure if it’s just very, very good or excellent! I’m starting to fall towards the latter judgment.